I've finished my first Mermaid footie sock. 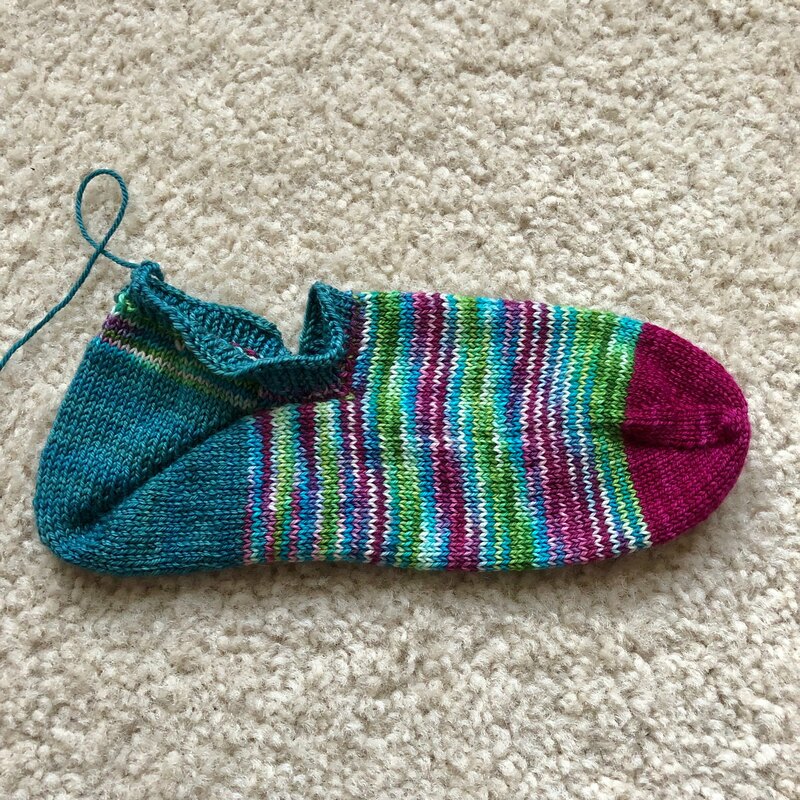 I used some Sweet Georgia Yarn Tough Love Sock leftovers for the toe, heel, and cuff in Lollipop and Sea Spray because I'm pretty sure I don't have quite enough Mermaid to knit both footies. Hopefully I can use up more than one little bit of leftover scrap yarn! I also need to let you know about some changes I'll be making with the blog. Previously, my goal has been to post four or five times a week and barring vacations and sickness, I've stuck to that pretty well for almost 14 years. There are times that I don't really have anything to post; whatever I'm working on looks virtually the same, no matter how much knitting I put into it; and sometimes it's a gift and I can't blog it. I also really want to get back to designing, and I have found that it's hard to commit to designing and testing while also blogging with any regularity. I was thinking about changing things after the first of the year, but I think I need to go ahead and change now. I will continue blogging but I'm only going to blog when I have something to actually share. I won't worry about showing up four or five times a week, and some weeks I might not blog at all. December is as good a time as any to start this because I'm working on some gift projects that can't be blogged anyway. Hopefully this will free up some of my creative energy. Good luck in designing, I look forward to seeing what new designs you put on Ravelry! Good for you, Melanie. You have to do what you need to do. Designing sounds like fun but I'm so much better at following the patterns. Any ideas for lace weight shawls? I originally found you through your designs which were lovely. I’m glad you are designing once again. It will be so much fun to see what you come up with. Best of luck!